5 Responses to Election Notes 14/04/10: Has anyone got Alanis Morissette’s number? almost as ironic as someone voting Labour for a ‘future fair for all’ when your manifesto refers to “no-nonsense action to tackle the problems caused by 50,000 dysfunctional families.” NewSpeak of the highest order. Well it is a Yaris. 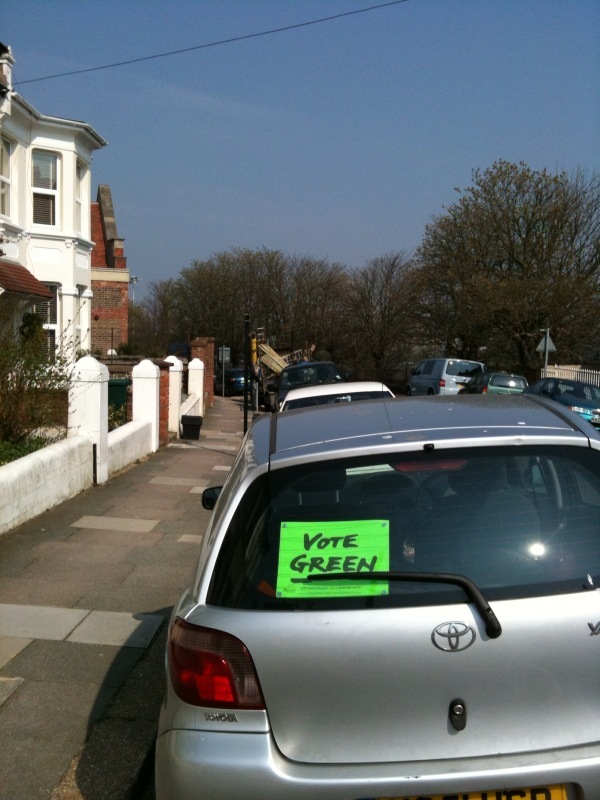 Is the problem here that its a car with a Green poster?!? Because thats ridiculous, the Greens don’t want to force people not to drive cars just provide people with the option so they dont have to drive them by making public transport and cycling infrastructure that actually works! Lots of Greens have cars. I think the argument that the Greens aren’t anti-car is rather fanciful, Allie. GASP! A Green who owns a car! Bloody sandal-wearing muesli-munchers.